Granted, not the most inspired name for a restaurant, but I need to confess to you something right off the bat, I love this place. I’ve been eating here ever since I moved to LA in 2008. All of their food is fresh and homemade. I love their soups. I love their salads. I love their pies. I love their sandwiches. Jesus, even their butterscotch pudding is wonderful. (Fans of Mozza’s butterscotch budino take note.) The staff knows me by name. I get all of our office lunches catered here. I buy people birthday presents like Noble’s bourbon maple syrup or Sqirl jam or some of their homemade candy from their display cases. What I’m saying is, Food LA is my boyfriend. So when I showed up on a rainy Tuesday evening right before they closed, I was nervous. Why? I had never had their burger before. Yeah, that’s right. Never. We’ve been together for almost six years and I’ve never had a burger there. Why? Honestly, I never have had the time. I usually rush in there and rush out without the time to wait for a burger. Or maybe I was scared. When it arrived, though, I got really excited. On a brioche bun lay a hand crafted 4oz beef patty with gruyere cheese melted on top, sautéed onions, a thick slice of tomato and arugula. Next to it were five golden spicy potatoes covered in aioli. One bite and I knew, all of my fears were completely unwarranted. The herbs and spices that were lovingly folded into that burger was something that I had only had in someone’s mother’s kitchen. There was no need for sauce or any kind of condiment. 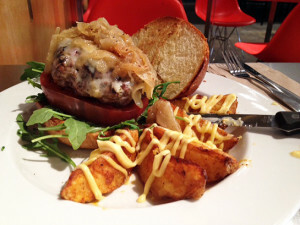 The herbs, cheese, and onions were enough to compliment the burger’s juicy flavor. I’m thinking about proposing to this place at New Years. Maybe a June wedding? Maybe August? Who knows. All I know is I’m going to put a ring on it.